Heat the chicken stock and coconut cream to simmer and add in the lemongrass, lime leaves, chilies and galangal and simmer for 10 minutes. Strain and return liquid to heat. 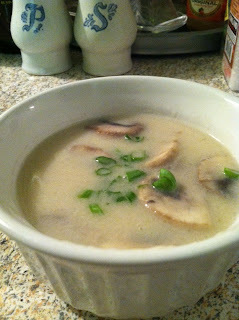 Add the chicken, mushrooms and scallions and simmer for another 10 minutes. Add the fish sauce,lime juice and S&P to taste.